I have found this to be a great meal to eat out in a restaurant. The lettuce really bulks up the meal so it takes longer to eat and all of the fat is included in the dressing, so there is no need to bring cream or oil to serve on the side. Not to mention that almost every restaurant will have this on the menu! Charlotte is not a “lettuce” loving type of person, but she throughly enjoys eating this salad. For young kids, I recommend making salads more kid friendly by serving them “chop” style, make sure all the lettuce pieces are very small so they can easily eat their meal! Feel free to use iceberg lettuce, baby spinach, or any other type of lettuce that you like. In fact, you can sub cucumbers or celery for the lettuce and use the dressing as a dip! Sorry for the poor picture as well, we were in a rush to go out to dinner! Combine the mayonnaise, olive oil, parmesan cheese, lemon juice and seasonings together in a small bowl. Stir to combine the ingredients very well. 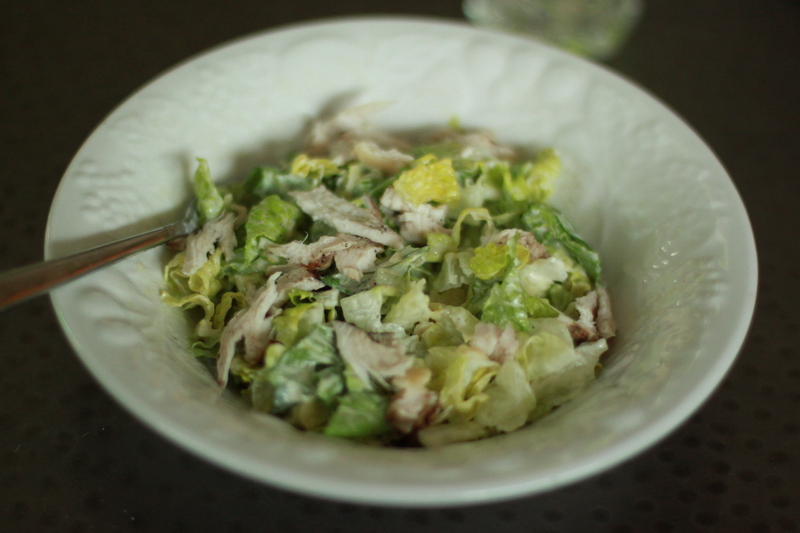 Place the lettuce and chicken in a salad bowl and top with the dressing. Toss to evenly coat all of the lettuce with the dressing. Scrape all of the dressing from the bowl onto the salad. Serve immediately after tossing or keep the dressing on the side until ready to eat. You could eliminate the mayonnaise and use all olive oil if preferred, but the mayonnaise really gives it a non-greasy feel when you are eating it.